I'm back with another Before and After. I give a lot of upcoming MUAs lessons to help with their craft, and today's look is from one of these sessions. 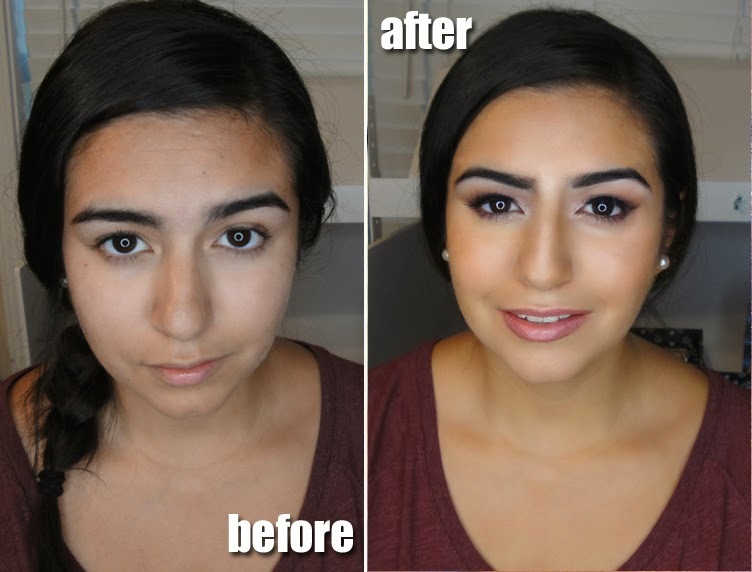 I let the MUA do one side of her model's face while I did the other. We went for a fresh, natural pink look. Check it out! It's important to master both dramatic and natural looks in order to be a versatile artist. When a lot of MUAs start out, doing natural makeup can be trickier to give them a transformative look, it can often look too light and amateur. The key is to choose the right colors and techniques. For example, we all know that the no-makeup makeup look takes just as many products as glam makeup but it requires a different application. For natural makeup, you want to make sure you focus on really nice skin and then pick the appropriate colors for eyes, cheeks and lips. On the model we used the Graftobian Super Cream Palette in Warm which I always recommend to build the kit because it contains so many shades that can be worn full coverage or sheered out. On the eyes and lips we went with a warm pink that complimented the model's tan skintone. We also applied a natural pair of lashes. It's all about the length and volume that you choose because lashes can look super natural or super glam. She looks really pretty. What eyeshadows did you use?